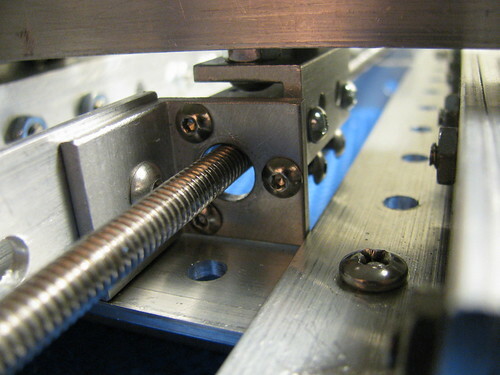 Make sure threaded rod is not bent - this will be obvious if you roll it on a flat surface. Replace with a straight one. Stretched/compressed thread - some rods seem to have this problem either at some spots or throughout the length. Replace with true or nearly true 1/4-20 TPI thread. Luckily the threaded rods are cheap. 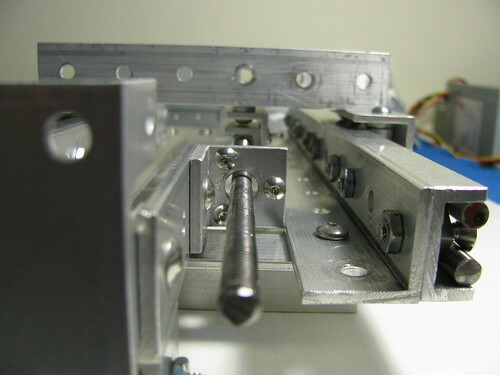 Defects/damage in some areas of the rod. Sometimes these can be removed with a needle file, otherwise replace the rod. The thread may be too sharp and this might create some extra friction. 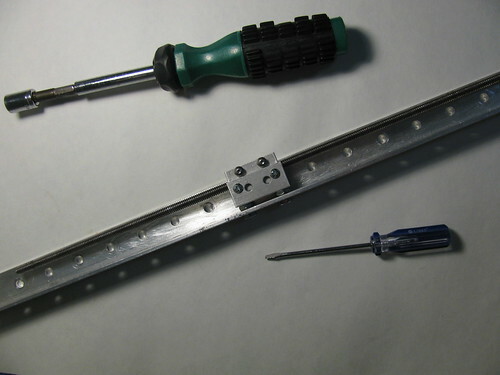 Use sandpaper and power drill to slightly reduce the outer thread diameter of the rod. Design consideration: translational degrees of freedom for lead nut and shaft mounts should be complementary to each other. 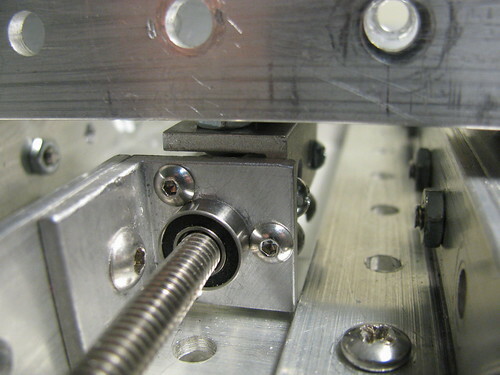 See pic on the left - leadnut/leadscrew can be adjusted in X and shaft mount can be adjusted in Z. Both can also be adjusted in Y (direction along the rod) but it's irrelevant for alignment purposes. Align coupling nut clamp in the leadnut mount first because it will be difficult to access later. See pic on the right. 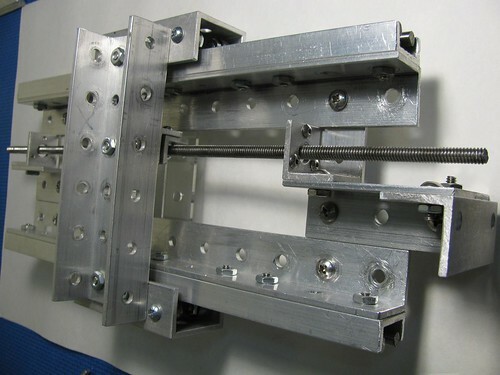 With leadnut centered between shaft mounts, secure lead nut mount so that the rod passes through the center of either shaft mount's opening. 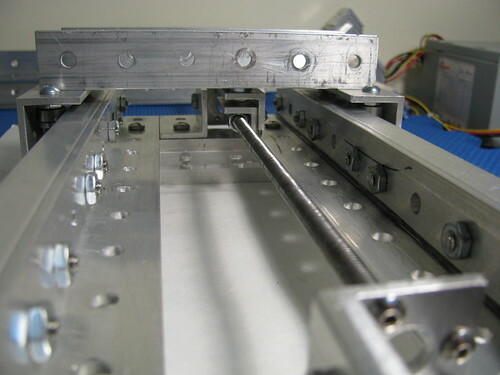 This may take several attempts and adjustment of shaft mounts along the other axis may be needed as well. 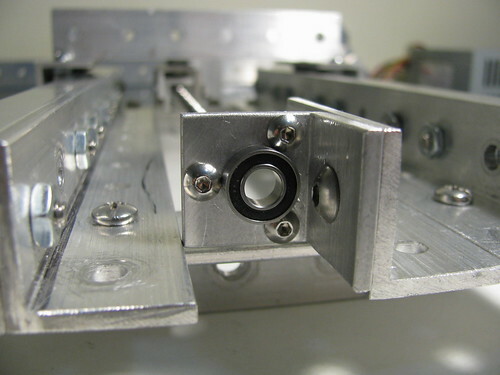 With stage in end position, add the bearing to the nearest shaft mount and verify that the rod can rotate freely. If it doesn't, go back to first step - better alignment is needed. Verify the same on the other end. 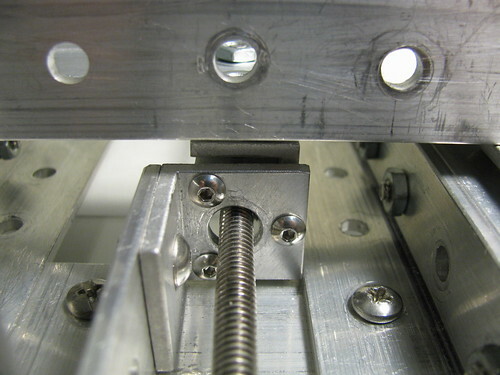 Verify free rotation of the rod with both bearings in place and the stage in end positions. If you have free rotation at the end positions, there should be free rotation throughout the travel length (unless the rod is bent or has defects in the middle - see Preparation).